Playas del Coco, in Costa Rica’s popular Guanacaste Province, was a sleepy fishing village until the mid-90s. Around that time, the bay of Papagayo’s pristine, beautiful beaches began to attract luxury resorts, like the Four Seasons, to nearby towns. Now Coco sits in the center of the tourism action and has developed into a popular coastal vacation spot, without losing its small-town charm. Aside from stunning beaches, outstanding sportfishing, and nearby national parks, what makes this part of the Papagayo Bay such a wonderful tourist attraction is its proximity to the Liberia International Airport. Playas del Coco is around 20 minutes from the airport, which is serviced by multiple air carriers. 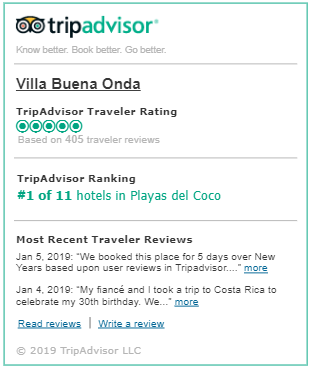 Villa Buena Onda hotel in Papagayo, Costa Rica is a 15-minute walk to Coco beach and downtown, where a variety of tourism-related businesses line Main Street, including restaurants, scuba diving, sportfishing and gift shops. There’s even a small Casino in the center of town, while popular beaches are just a short drive or boat ride away! The entire region of Guanacaste boasts excellent warm weather year round, scenic landscapes, national parks, hundreds of miles of coastline and an International Airport, providing convenience and plenty of options for fun and adventure to make for an unforgettable vacation. There are several popular ways to get to the Hotel Villa Buena Onda in Papagayo, Guanacaste. By Plane – Fly direct to the Liberia (LIR) airport (20 mins to Coco) or fly into San Jose (SJO) and then take the ground transfer (4 hrs) or a domestic flight to Liberia (55 mins). By Car – Take a right out of the LIR Airport going West. You will see signs for Playa del Coco. Follow them for approx. 20 minutes to Coco. As you enter Coco, the road divides with an old anchor at the division. Take a LEFT just before the anchor, turning off the Boulevard. The road forks after the turnoff, stay RIGHT (straight) at the fork. Continue on a dirt road approx. 150 meters and bare left, passing a liquor store on your right and houses on your left. Just past a condo project on your left, take the next LEFT up a steep dirt road. 20 meters later, you’ll arrive at The Villa entrance. By Private Transfer – Let us arrange for you to arrive in style! A private shuttle from Liberia to our hotel is $89 one way and can be booked directly along with your accommodations. The area around our Villa is packed with things to see and do. Below we have included some of the main highlights. Please speak to our staff about these and other options and they will be happy to help make suggestions and also to arrange your outings.